Starters: Drew Hutchison, Deck McGuire, Joel Carreno, Chad Jenkins, Ryan Tepera. "(Hutchison) dominated three levels last season," manager Sal Fasano said. Relievers: Ron Uviedo, Yohan Pino, Danny Farquhar, Fernando Hernandez, LHP Evan Crawford, LHP Aaron Loup, Matt Daly, LHP Jared Potts. Infielders: Ryan Goins, Mike McDade, Koby Clemens, Jon Diaz, Mark Sobolewski, Kevin Howard. Outfielders: Brad Glenn, Justin Jackson, John Tolisano, Brad McElroy, Brian Van Kirk. Catchers: A.J. Jimenez, Brian Jeroloman. Notes: Eleven champion Fisher Cats return. It's a versatile bunch. Tolisano and Jackson can play 2B or OF, and Van Kirk has moved around this spring. Clemens played first, third, LF and catcher in the past two seasons. Howard returns as the reigning Eastern League Championship Series MVP. Jeroloman makes his fourth stop at New Hampshire. Roster isn't official until Thursday. Could be a roster swap or two in the next couple days, plus the addition of DL players. 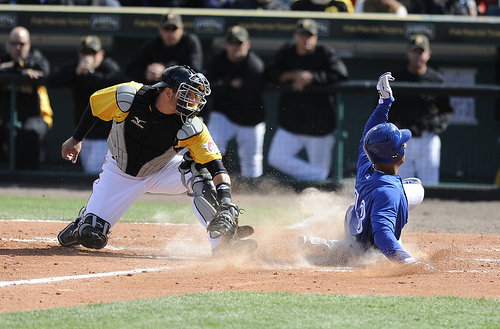 Earlier this spring, Anthony Gose scored from second base on a dribbler to the mound against the Pirates. That's tough to imagine, I know, but, fortunately, I saw the rare feat with my own eyes. Stealing home against Jarrod Saltalamachia and the Red Sox? Please ... Salty tends to drive Boston fans crazy with his errant throws and slow rainbows back to the pitcher. Gose had already stolen second and third before stealing home on Thursday to beat the Red Sox, 3-2, and giving Toronto it's franchise-record 22nd win of the spring. Lefty Justin Thomas was on the mound -- righty Yan Gomes the hitter -- when Gose took off for home plate with two outs. "I never saw anybody steal second, third and home in the same inning in my career," Blue Jays manager John Farrell said at mlb.com. He is obviously exciting. He can take over on the base paths. He has a combination of pure speed, plus the ability to read some things. Just turn him loose. He's a pure base stealer." Who do you pick from the Blue Jays on your fantasy team? Brett Lawrie projects to hammer anywhere from 12 to 26 homers. In November, my prediction for the kid from Langley was 27 homers, 91 RBI, .280, 22 SB. I'm still comfortable with those numbers, but now I think he'll steal more than 22 bags. Colby Rasmus and Henderson Alvarez would be excellent late-round picks in your draft. Just saying.